A good funeral is one that gives thanks for and even celebrates a life, whether short or long. It can bring comfort, but when we are at our lowest ebb a funeral can be hard to plan. 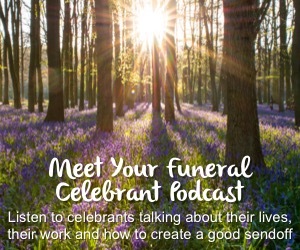 Funeral Celebrants are people who can help you create a funeral that is right for you and honours the person who died. We are the largest and directory of Funeral Celebrants in the UK, established in 2008, and have verified details of 1335 Funeral Celebrants. Please note - we aim to list every Funeral Celebrant in the UK, regardless of affiliation, but right now we're still building our database. If you are, or know of, a celebrant that's not listed, please Contact Us or Register and add your free listing.